Just off Evergreen Way lies burger country. 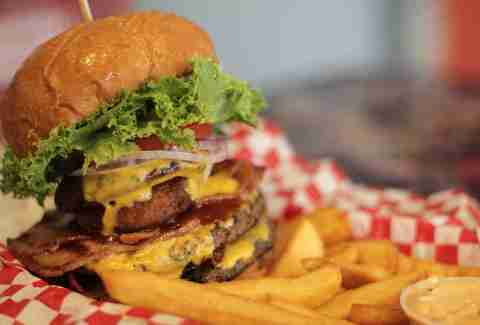 You can’t go wrong with Nick’s Deluxe, which has two patties, grilled mushrooms and onions, cheddar and Swiss cheese, hickory bacon, avocado, Nick’s homemade garlic mayo, lettuce, tomato, and pickles. Be sure to grab Nick’s special sauces with your fries too -- nobody would tell us what was in it, but trust us -- you want it. This well-loved college bar is infamous for its burgers, just consult this list. 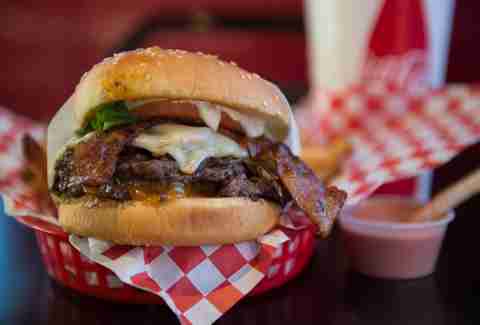 Cheap, greasy, and delicious; The Coug’s cheeseburger is a winner regardless of how the Apple Cup panned out this year. And most years for that matter. You won’t find any hard liquor here, but if you’re an alumni, you can go ahead and cry into a nice cold beer. 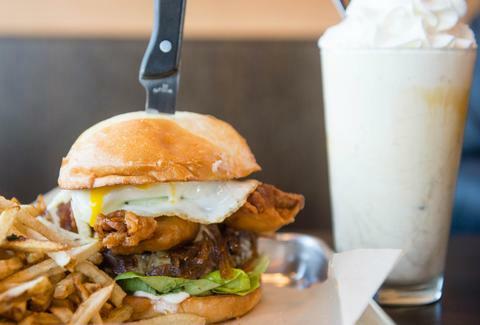 The newish Spokane establishment is definitely making moves with its double burger, which is made with house-bacon burgers and a fried egg. Located right off of Main Downtown, this super-stylish bar is divided into two floors with different cocktail offerings on each. And because it's from the people behind Casper Fry, you know this stuff is going to be good. 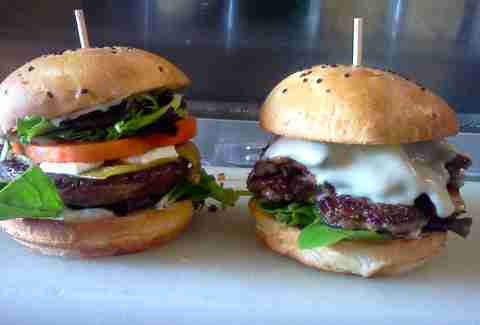 Fiamma Burger in Bellingham definitely knows how to do a mash-up. You’ve never had a burger like their Double Dog Dare Burger, which has two 3oz beef patties, a hot dog, two slices of American cheese, fried pickles, jalapeños, shredded lettuce, ketchup, mustard, and relish. The expansive selection of taps at this Redmond joint gives light to its name, so no need to ring up PETA. 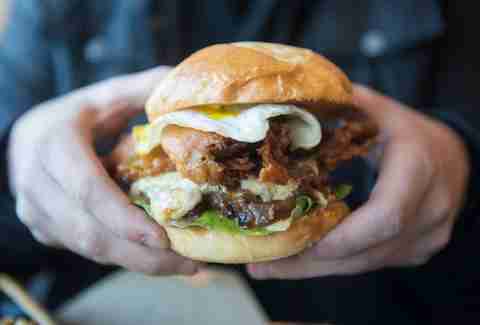 Among the bevy of burgers Tipsy Cow purveys, our favorite is The Rockstar, which has custom-ground, grass-fed beef, brew battered & fried Daily's bacon, maple syrup drizzle, Beecher's Flagship White Cheddar, a fried egg, caramelized sweet onions, bibb lettuce, tomatoes, and Tipsy sauce. Pro-tip: pair it with a salted caramel shake. 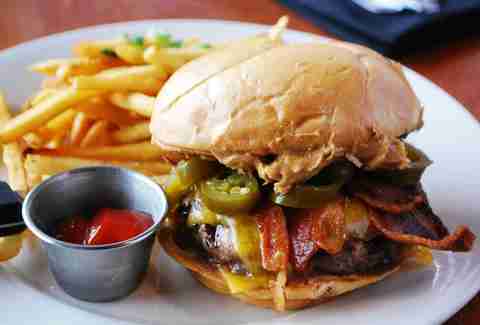 Recipient of countless awards from acclaimed publications like Men’s Fitness and USA Today, this spot, just about 15mi East of Seattle, slings a signature burger that boasts a whopping half pound of ground beef covered in roasted red pepper mayo and topped with lettuce, tomatoes, and bacon. 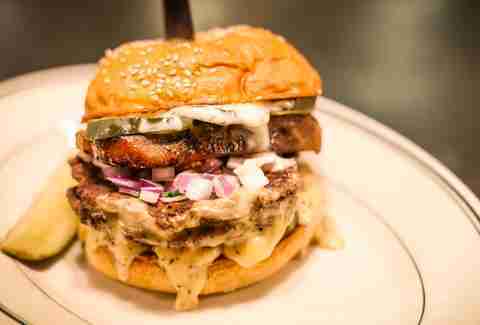 This not-quite-waterside burger shop boasts a selection of seriously messy burgers. 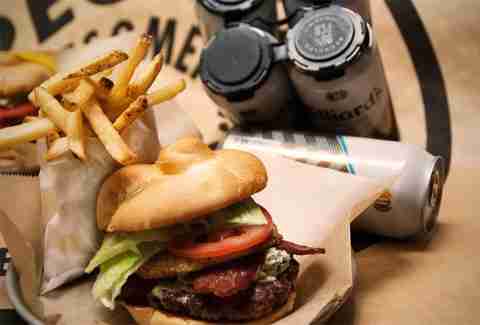 From indulgent numbers like the Gorgonzola & avocado burger, to classics like our favorite the bacon cheddar. All burgers come with your choice of side, with options like blue cheese potato salad, beet chips, beer-battered onion rings, and more. Green Spoon’s signature burger is a one-third pound hand-pattied beef burger with organic greens, tomatoes, dill pickles, and cracked pepper mayo. It's perfect way to fix yourself up after an afternoon of wine tasting. Other burger option at Green Spoon include The Aussie Lot (fried egg, shredded beets, and bacon), The CO-BLAT (cheddar, sweet onion, avocado, and bacon), and The Bleu Shroom (bleu cheese and mushrooms, duh).